Space Age style, as seen on star trek, chrome craft unicorn "Sculpta" chair. The chairs have tufted vinyl upholstery, super rare red color, seats rest on solid cast aluminium V-shaped leg. Clean, original showroom condition. A handsome set of four rosewood ladder back dining chairs by Svegards Markaryd Chairs are burnt marked Svegards Markaryd made in Sweden. 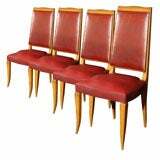 Set of four high back French dining chairs upholstered in red oil cloth with medium wood colored frames. Wood frames are sturdy. Seat springs need to be retied. A rare set of four teak and oak dining chairs by Finn Juhl for Bovirke.